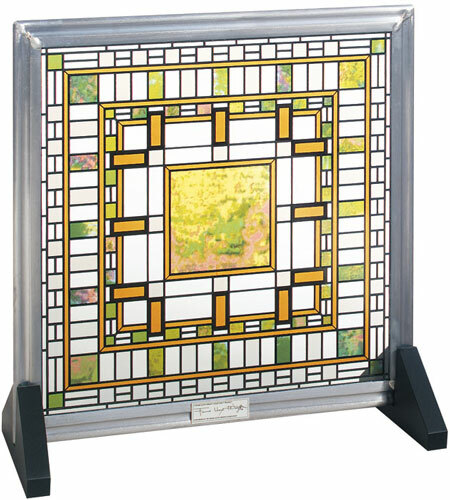 Dimensions: 8 7/8" x 8 7/8"
Reproduced from a window in the Darwin D. Martin House in Buffalo NY, Opalescent is truly a masterpiece, reflecting an iridescent light both from within and without this magnificent home. Known as Frank Lloyd Wright's most integrated complex and the quintessential Prairie House, the Martin House was built in the early years of the 20th century, in Buffalo, NY for Darwin and Isabelle Martin. Frank Lloyd Wright took personal responsibility for ensuring that every detail of the house unite in an expression of his inimitable style, including the vibrant stained glass windows of radiance and light. This Frank Lloyd Wright Collection product is authorized by the Frank Lloyd Wright Foundation. Taliesin West, Scottsdale, Arizona and has been developed with the cooperation of the Dana-Thomas House Foundation. A portion of the sales of this product supports the conservation and education programs of these institutions.